A Cypress Lakes generator installation in Florida has become a necessity as the weather turns more unpredictable every year. Natural disasters can happen almost anywhere in the world. When hurricanes, lightning, and wind storms strike one of the first things to go are the power lines, and life turns to misery. The internet stops working, the refrigerator goes out and your food spoils, life inside your home becomes unbearable as your air conditioning, television, water heater, stove, and lighting stop working. Fortunately you can plan ahead and install an automatic generator. When power goes out, automatic generators go on almost immediately. So your home comes alive again in a matter of a few seconds, and your life just goes on as normal. RCS Electrical Services is your expert Cypress Lakes generator installation solution provider. We are specialists in terms of generator sales, generator installation, and generator service, and are able to work with all the best brands of generators. We are certified by Generac, Centurion, Kohler, Briggs and Stratton, General Electric and others. Contact us now if you are in need of generator service, generator installation, or generator repair. Estamos aqui en esta comunidad para dar servicio de reparacion, installacion, y mantenimiento de generadores y plantas electricas automaticas. Contactenos para cualquier problema con su generador o planta electrica. Podemos darle asesoramiento tecnico se desea exportar generadores o plantas electricas. If you have small children or elderly family members living at home, you must have an automatic generator installed. The little ones just don't understand what is going on. They just want to watch their favorite TV programming, sleep in their own bed, play with their toys, be fed when they are hungry or thirsty. If it gets too hot or too cold for their comfort they get very irritable, and then life just becomes miserable. A Cypress Lakes generator installation in Florida will avoid all these inconveniences, and afford you the protection you need in a time of emergency. 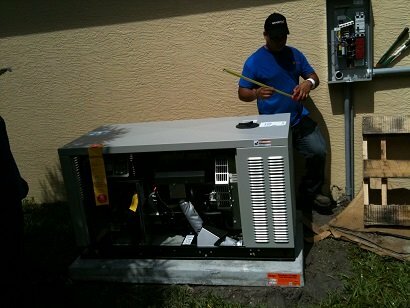 RCS Electrical Services offers a complete solution for your generator installation Cypress Lakes FL. We handle the entire project, so that you have peace of mind in the knowledge that you have a single point of contact for all questions and concerns. From purchasing the generator, to handling the concrete base and installing the electrical wiring and fuel line, RCS Electrical Services will handle your project, with integrity and professionalism. When you hire the big box store to do your project, often times they have no clue what is going on with your installation. They simply don't have any idea about even the simplest things, like how a generator works. This is not the case with us. We are the true experts, who are trained and certified to bring you complete trouble free solutions to your generation installation projects. Each Cypress Lakes generator installation has its own set of unique circumstances, and needs to be individually evaluated. There is no cookie cutter approach to doing this work. The geography and topology of your property, together with your own individual way of using energy, coupled with the way your electrical service was initially installed when your house of building was constructed, create a unique set of challenges for each installation. Usually there are more than one solution to each installation, and they must be evaluated and analyzed by a knowledgeable technician. The technician must then explain these options to you so that you can make a decision that makes sense for your unique set of needs. When RCS Electrical Services evaluates your project, and presents you with our solutions, we do it simply on the basis of what is best for you and your family. We make sure that what we are suggesting is absolutely the best solution for you, customized to your unique needs and optimized for your specific set of circumstances. Your Cypress Lakes generator installation experts need to know your current electrical load or usage. This information is used to size a generator that can provide the amount of power you need. In order to do this, you must submit some information related to the size of your home or building, your current electrical equipment, and a list of your small appliances. Generator sizing is an important aspect of your installation. Wrongly sizing your generator can negatively impact your project. A generator that is too big for your application will penalize you twice. Once with a higher up front cost for the equipment, materials and installation cost. An over sized generator will penalize your for its entire service life, levying higher running cost in terms of fuel consumption and maintenance. 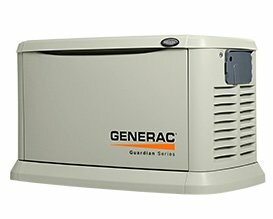 A generator that is too small, will disappoint you when it won't operate properly during a disaster and other emergencies. Once you have filled a load calculation form, your generator installation expert can start the process of specifying your generator by sizing it correctly. RCS Electrical Services is committed to the idea of offering drama free and surprise free installations. We not only strive to perform great installations for you, but we also offer great warranty services for your peace of mind. Our installation comes with a one year labor warranty, and at least three year product warranty. If anything is wrong with our labor for one entire year, we will correct it free of charge to you. If your generator fails due to electrical or mechanical reasons during the first three years after installation, we will start a warranty claim process with the manufacturer, and then make the repairs for you at no charge. RCS Electrical Services is proud of the level of skilled we have gathered through many years of field experience, coupled with technical training received from generator manufacturers such as Briggs and Stratton, Generac, General Electric, and Kohler. When you ask us to do your project, you can be assured that we don't take the fact that you chose us lightly. We will work for you employing the best techniques, materials, parts and equipment so that your installation has the quality you and your family deserve and expect from your Cypress Lakes generator installation professional. Our technicians think of each other as being part of a family here at RCS Electrical Services. When we give you a completed project, is like you are also joining our own family, as we will continue to service your generator in the future. Not only you get a professional generator installation, but we do it in a way that shows that we care, and that your family well being matters greatly to us. Your Cypress Lakes generator installation comes with world class customer services. RCS Electrical Services has done generator installation for two major national retail stores; The Home Depot, and Lowe's. During the time that we installed for these stores, we interacted with many different customers. By having this daily interactions, we learned valuable lessons in customer service. You now can be the recipient of all the knowledge we have acquired through the years. You will have the benefit of great customer service, without the sticker shock of dealing with a big box store. When you deal with a big box store, you are just a number to them, not an individual, and most certainly not a human being. When you hire us, you become part of our family, and you will be treated as such. Contact us when you are ready for your generator installation.